I saw my friend the other day and he said, "it looks like you have a basketball under your shirt!" I hadn't even noticed my belly shape but I totally laughed at the thought. His comment did make me think of how far I've come from the early days of finding out I was pregnant. Everyday, I'm reminded of how close my due date is (mid-May!) and everyday, I get a bit more anxious, nervous, excited and scared. I'm a ball of emotions (no pun intended) and I am experiencing a grieving period with my "old life." Making last-minute plans with friends, watching TV at odd hours of the night, sleeping in...all the little things that I took for granted when it was just the husband and me hanging out. But, what I might "lose" in independence I know I'll gain in other areas. I'm not sure what this might feel like but based on all the stories I've read and heard over the months, there's an indescribable love and fulfillment that comes with motherhood. I won't ever stop worrying or stop over-thinking (it's my nature and I'm sure it'll intensify with a child) but, I can take things one day at a time and enjoy each moment. That's something I've always struggled to reconcile being such a planner in life. As my friend wisely reminded me, "there is a time for everything." Just enjoy the ride. U look great with that cute belly!! Leather jacket and sandal matches perfectly!! Great altogether. Wise words! Love the outfit, especially the jacket. Not sure if this is a duplicate or not.. But I love your basketball belly! I think that is true! Your friend is absolutely right. And it is different, but it is amazing. You will love it. I was due on May 19 last year and my baby was born in May 5--he was the earliest of my four kids. Take it easy and rest while you can! Lol! A basket ball! I don't have any child so I can't offer anything. But I love your style very much! ;) Every child is a flower. Some blooms early, some just take their time. But they will be a flower when the time comes. Your basketball belly is adorable and you always manage to look so cute and stylish...but I can't imagine you're feeling comfortable at this point! I always have a hard time letting go of certain parts of my life, so I understand (to an extent) what you mean here. Usually, I'm scared of the unknown! OMG! you're too cute!!! Love the way you glow here. Oh you are so close to the end! I don't anyone is ever prepare and ready because once the baby arrives, the baby decides how your life will be for the first few months. 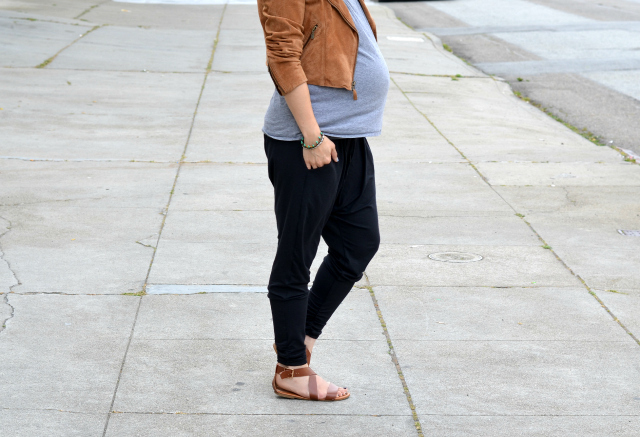 You have been stylish though your pregnancy and this outfit is no exception! Wow you manage to look so fashionable and chic during pregnancy! You are so cute!!! I love that jacket and shoes! It DOES look like a basketball! haha :) That jacket is gorgeous! congrats in reaching the final stretch of your pregnancy! best wishes! Life will definitley change, but for the better. Enjoy these last few weeks and get ready for a fun ride! Your suede jacket is to die for! Such a cute and feminine casual look. haha ok now that he said it i can totally see it. gah your due date is SO CLOSE! and honestly, i think youd be nuts if you werent so excited/scared/worried about it. it's a huge change! but it definitely sounds like you've got this :) also, ive been absolutely loving your maternity style- you're the chicest expecting momma i know. you still look super chic though! You're almost there Nancy! I love your jacket and sandals. They look so good with your outfit! I'm really impressed by how fashionable you have still remained despite being pregnant. I am pretty sure that when I'm pregnant I will be living in sweatpants. And of course things will be different, but as long as you have good supportive friends who understand that motherhood comes with new challenges, things should be okay. You look adorable! Embrace the last few weeks! I'm sure you'll love the new lifestyle a baby brings! You look amazing for being nine months pregnant! This outfit looks so classy and comfortable, love how you paired the harem pants with a suede jacket. I'm loving your suede jacket, what an amazing find! You look so amazing! I love your leather jacket and those strappy sandals. Your basketball belly is perfect and adorable! You are so chic. I love this outfit. I hope you know I am taking maternity style notes from you. Also, thanks for how real yet positive you have been. I've loved following along your journey. Love this casual chic outfit! And your bump is so cute- love it! Latest Post: How to Wear Crazy Leggings - From the Gym to the Street!